Dwight was born on April 13th, 1929 in Newcastle, WY to Clifford and Gladys Wicker. Dwight obtained his GED in Casper, WY. He served in the United States Army and was honorably discharged in January of 1957. Dwight was a heavy equipment operator and owned and operated D.O. Wicker Construction. He married Gladys Tronstad-Johnson on December 16th, 1968 at United Methodist Church in Casper, WY. 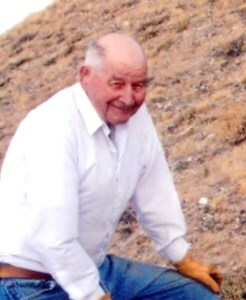 He loved rock hunting, especially for jade. He enjoyed fishing and camping with his wife, children, and grandchildren. Dwight is survived by his loving wife of 50 years, Gladys Wicker; Son, Jessie Johnson; 7 grandchildren; numerous great-grandchildren; and many nieces and nephews. He is preceded in death by his parents; brothers, Roy Wicker and Cliff Wicker, daughter, Carlotta Spaniol; and son, Lonnie Johnson. A Funeral Ceremony with Military Honors will be held on Friday, February 1, 2019 at 1:00pm at Oregon Trail State Veterans Cemetery. Add your memories to the guest book of Dwight Wicker. I am so very saddened to hear of Dwight's and Lonnie's passing. Dwight was such a good and kind man and will be missed by all. I'll always remember coming to your house, Gladys, and having a drink on your back porch and listening to Dwight's many stories. And Lonnie was a good friend during my high school years and will be fondly remembered. Please know I am thinking about you and Jessie and praying that God will comfort you both during this difficult time. God bless you! My heart is so very sad. What a wonderful man Dwight was. I will cherish the memories of our visits. Gladys my heart goes out to you. He will be missed by all who knew his wit and wisdom. Just learned of Lonnie’s passing, and now Dwight. I have fond memories of happy times with Lonnie in our youth, and your understanding and kindness. Our hearts go out to you and your family.